Hey! Remember my issue with flat baked goods? 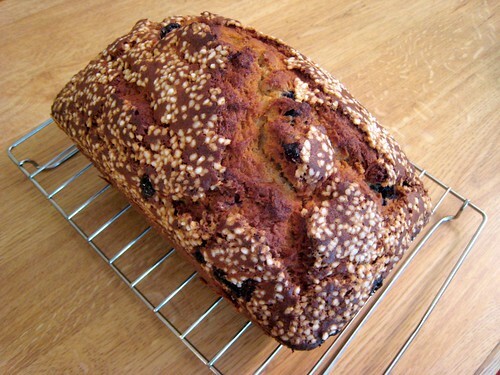 I have no idea how I achieved this one, but I managed to bake a loaf of banana-blueberry bread that rose up beautifully. I almost didn't want to cut into it, lest it should somehow deflate. I used a recipe somewhat modified from Dozen Flour's, cutting down the sugar, adding more flour, adding some milk, using one less banana (because I only had two), and throwing in blueberries. As with the lemon-blueberry yogurt loaf, I also sprinkled pearl sugar on top, which I am liking more and more as a cake/muffin topping. It's pretty, it adds texture and sweetness, and it's not messy like frosting or powdered sugar. The sugar does lose some of its crunch as it gradually melts into the baked loaf and pulls moisture from the air, but that only happens after the cake has been around for a few days. If you're sharing this loaf with other people, the sugar melting won't be a problem. Preheat the oven to 375 degrees. Butter and flour a 9-inch loaf pan. Using an electric mixer, cream the butter and sugar in a large bowl until the mixture is fluffy. Add the eggs, bananas, milk, and vanilla extract and mix until combined. It's okay if the batter is a little lumpy from the banana. Whisk together the baking soda, salt, and flour in another bowl and then add to the wet batter. Mix on low speed, scraping the sides of the bowl as needed, until the dry ingredients are incorporated. 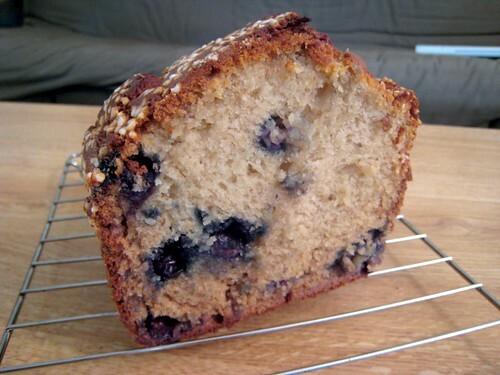 Toss the blueberries in about a tablespoon of flour, and then gently fold them into the batter. Pour the batter into the prepared loaf pan and sprinkle pearl sugar on top. Bake for 15 minutes. Reduce the temperature to 350 degrees and bake for another 45 minutes, or until a toothpick inserted in the center of the loaf comes out clean. Remove from pan and place on a rack to cool. I adore your title; brought me back to my childhood! Great recipe idea, and I almost always cut down on the amount of sugar as well. Glad to hear you cut the sugar as well—I find so many recipes sweeter than they need to be!